1. 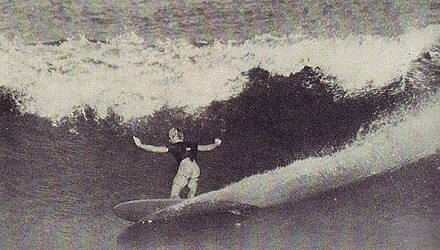 Keith Paull was a top Australian surfer 1965 to 1973.
see Paul Witzig Hot Generation. 2. Australian Champion 1968, beating both Farrelly and Nat. 3. Australian competitor at Puerto Rico World Contest, 1968. 4. Australian shapes for Hohnesee Surfboards (Queensland) and Peter Clarke Surfboards in the 1960's. 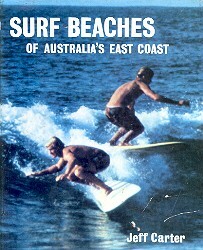 The cover of Jeff Carter's Surf Beaches of Australia’s East Coast (1968). Keith Paull (1968 Australian Champion) goes right and Wayne Lynch (1968 Australian Junior Champion) goes left. Further shots from this session, probably shot in the lead up to the 1968 Australian Titles at The Gardens Narrabeen, are reprinted pages 121 to 128 and also include Nat Young, Midget Farrelly and Ted Spencer. After winning the Australian Titles, Keith Paull visited England, introducing the most recent round-tail design to local surfers and manufacturers. He surfed at Newquay and Jersey and competed against Rod Sumpter at Porthtowan before meeting up with Greg MacGillivray, and Greg Freeman, Billy Hamilton and Mark Martinson in France. 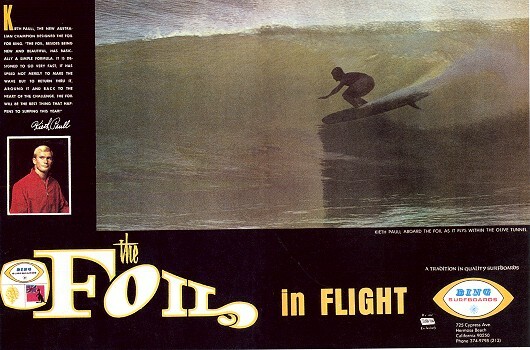 The Foil design for Bing Surfboards, USA. Usually 7 to 8 ft, pin nose, round tail. Commonly Waveset fin box and moulded plastic fin. A second generation short board following Vee bottoms, 1967-8. Bob McTavish's Tracker, by Morey-Pope Surfboards USA. Unfortunately the original print was not available on video or DVD. It was later re-cut, including considerable footage from their earlier films, for example the car race (naturally won by Mickey Dora) from Free and Easy, and re-written for release as The Sunshine Sea in 1971. Surfing March 1984, Volume 20 Number 3 page 99. 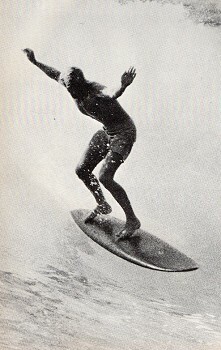 Originally published in Surfer September 1969, Volume 10 Number 4. First Annual End of the World Issue. Major Hawaiian performance, huge Makaha 1969. 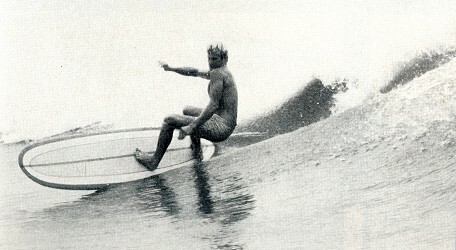 Randy Rarrick credits Keith Paull as the first surfer to ride Supertubes, South Africa. 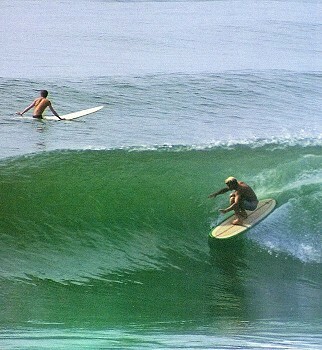 Keith Paull Surfboards, Kirra Qld circa 1970 -1972. Harmony Surfboards , Kirra Qld circa 1972 -1976. Keith Paull Designs decal contributed by Peter Coonors, February 2010. 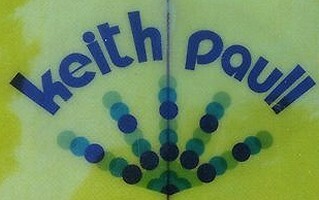 Keith Paull, circa 1973 decal contributed by Sammy, March 2013. Keith suffered a major breakdown and ceased all surf activity circa 1975. Keith Paull article STYLISTIC EVOLUTION, page 56 + photos and ads. Geoff Cater (2009-2018) : Surfer : Keith Paull.